It’s funny to say, but people are always talking about communication. In every relationship dynamic, the secret…is always communication — with your child, with your clients, with pets, with other countries, with your barista. Are you communicating effectively? Even more to the point, how can you communicate better? This has always been a trending topic and it’s even more of a challenge now. With so many ways to reach out and because the traditional work environment is morphing with flex hours and telecommuting, virtual possibilities, it helps to reboot the conversation. The one thing you will learn quickly is that it’s all about engagement. You have to be engaged in the solutions you put forth or the team won’t be either. So, if you really care about boosting internal staff communication to improve collaboration and create a sense of community, then you’re already on the right track. You care. The sooner we stop talking about communication and make improving it a real priority, the sooner we will see the wonderful effect it has on team productivity and morale. The leaders have to lead. If you want to encourage active internal communication amongst the staff, you’ll want to get in the mix. There are teams all over the world who find themselves with new directives sprinkled with enthusiastic words about the new intranet tool that has been licensed — so the company can better connect. It improves efficiency, they’re told. And, while this may be true, so many of those sharing the new mandate will never be seen actively participating in the intranet. They say the best way to lead is by example. Well, whether you intend to or not, you’re always leading by example. So get in there and show them how it’s done! LibGuides CMS has Groups functionality. Combine that with its Access Controls feature and you can create a locked down group and use it as a staff intranet! Many libraries are starting to do this as it’s super convenient. Your internal group in LibGuides CMS can be a place where you get to know each other better. You can have each team member build a guide where s/he shares not just education and work experience, but also hobbies and interests, favorite TV shows and go-to Karaoke songs, photos of family or pets or a favorite vacation vista and more. You can facilitate collaboration on projects that should be tackled next or get feedback on your latest instruction session idea by enabling Discussion Boards. You can engage with your team right in your site by encouraging open discussions or you can post specific questions. 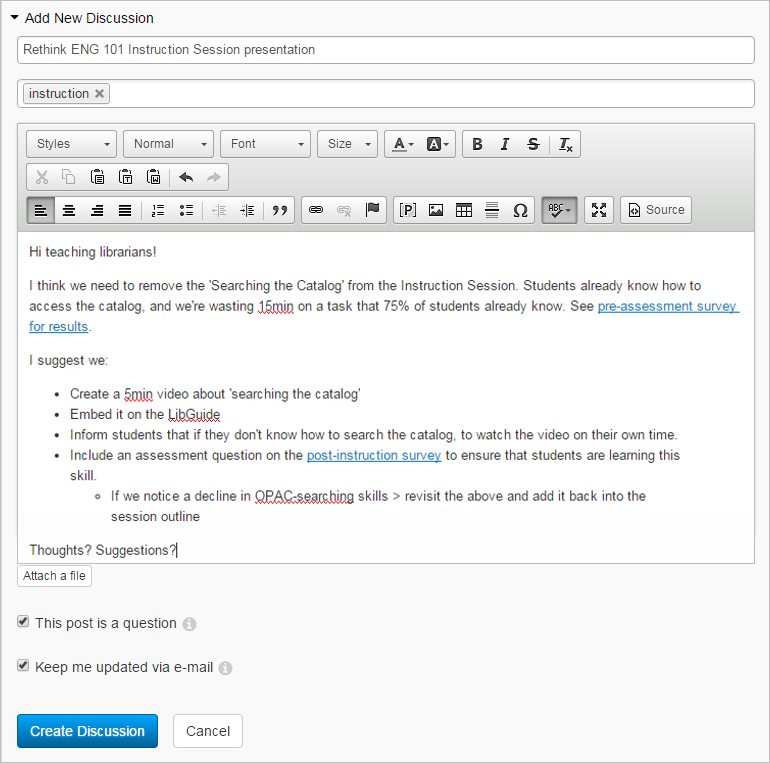 Remember, you can enable Discussion Boards on as many guides in your intranet group as you wish! 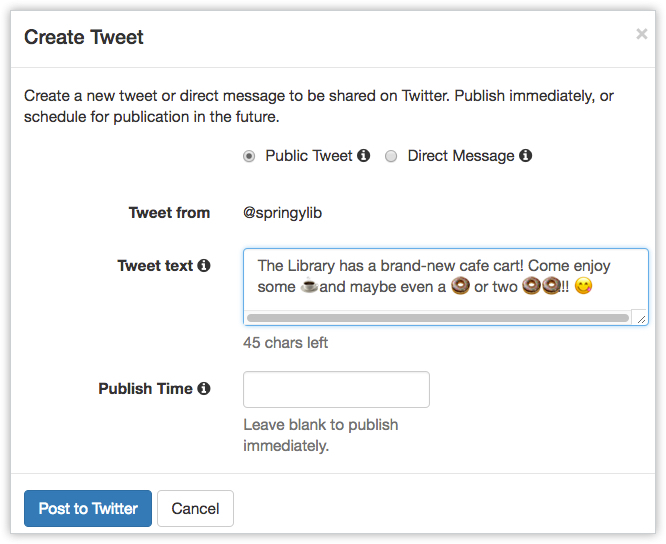 Cultivate a fun internal voice by using the blogging tool. Maybe your library organized a particularly successful event recently. Or, maybe you had excellent reviews on a recent class you offered. Have the folks in charge write a blog post about it. This gives staff a chance to share and shine! It’s your intranet, what do you want to use it for? Ensuring an actively accessed intranet is about making it a “place” you’d want to hang out. Of course, you can build guides that hold documents and files and links and images pertaining to a current project. But alongside those, be creative about your guides. Perhaps the Director wants to build a guide about what’s on the horizon with tabs for each quarter? Give your retiring colleague an opportunity to build a farewell guide! Maybe you should start a staff book club or book review guide! Have fun! This is where communication leads to community. Do offices even have the proverbial water cooler anymore? At Springshare, we’re chatting all the time, but from our desks or devices. Don’t curtail the chatting. Instead, foster it. It’s much faster than opening/sending/replying to emails. LibChat, a component of the LibAnswers Platform, not only helps you answer your patrons efficiently, it also allows you to chat amongst yourselves. You can transfer questions from patrons to another operator. This is useful if there is someone better suited to answering the question online with you or in case you are about to go on your break and you need to start feeding questions to the next person on duty. You can ask a colleague a question — behind the scenes — to help you answer the patron. You can chat with all LibAnswers colleagues that are online at the time or initiate a chat with someone in particular. A mixed bag is good. People will chat with each other about projects, ask for feedback, share an experience. But they’ll also send a birthday shout out and ask each other about playlists that move the day along. The important thing is that it’s a happy work environment. People who know and like each other want to collaborate. 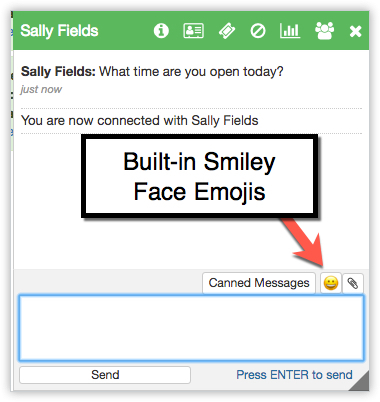 Plus, the LibChat Operator Console was just updated with an entirely new interface making internal/staff-only chats that much easier. Check in — so they don’t check out. You can set up tools and you can implement strategies to improve communication in your workplace, but one of the best things you can do is frequently check in with the team. Use LibWizard to create an anonymous survey and ask folks if something is missing from the intranet. See if there’s a page they never use. Use the multi-select checkbox field to ask them which portions of the intranet they find most useful or interesting. 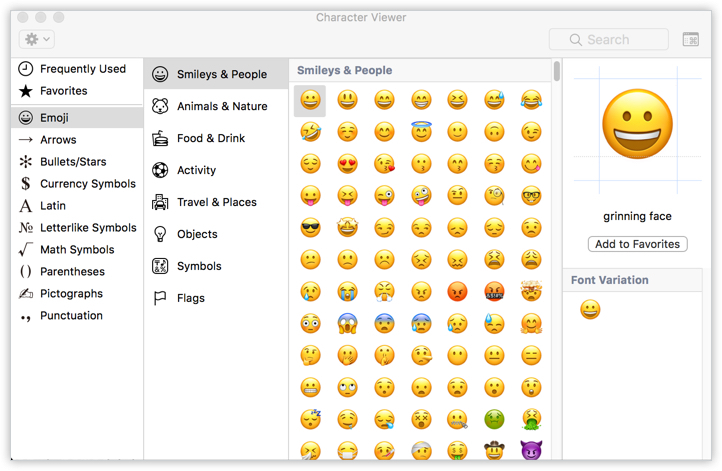 Not only will it help you improve by filling in the blanks or kicking out stuff that’s just taking up space, but it lets your team know you really do care about nurturing a productive and supportive and — dare we say — fun workplace. We have a brand new mini-release for LibWizard out today. This is just a maintenance release that is mostly concentrated on often requested bug fixes and some back end performance tweaks. You should notice a faster, smoother, LibWizard experience! Corrected a usability issue when LibWizard assets are embedded into LibGuides. Fixed a problem where users were unable to edit the date and time field on reports. Corrected a few typos on both the welcome and thank you screens. Corrected an issue where checkbox fields set to display in multi-columns were not indented correctly. Assets will now sort correctly when sorted by the created date. Changes in asset title are now applied without refreshing the page. We encourage you to use LibWizard with HTTPS but if you’re not, you should definitely give it a look. When web browsers start to force HTTPS, some of your forms my break if you’re not properly prepared so get started now! We’ve written more about HTTPS on a previous blog post, so be sure to check that out. ..says Andrew Adler, director of the Georgetown College Library, when asked why the Library is using the entire platform of Springshare tools. Andrew, like most librarians, wears a lot of hats. From teaching library instruction, manning the reference desk, creating training tutorials for student workers, and being available nine hours a week for one-on-one research consultations, plus being the director for the entire library – he needs their web platform tools to “just work and be easy to use“. 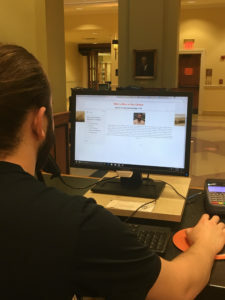 The Georgetown College Library uses the entire Platform of Springshare Tools – and they use LibGuides CMS to power their Library Website. 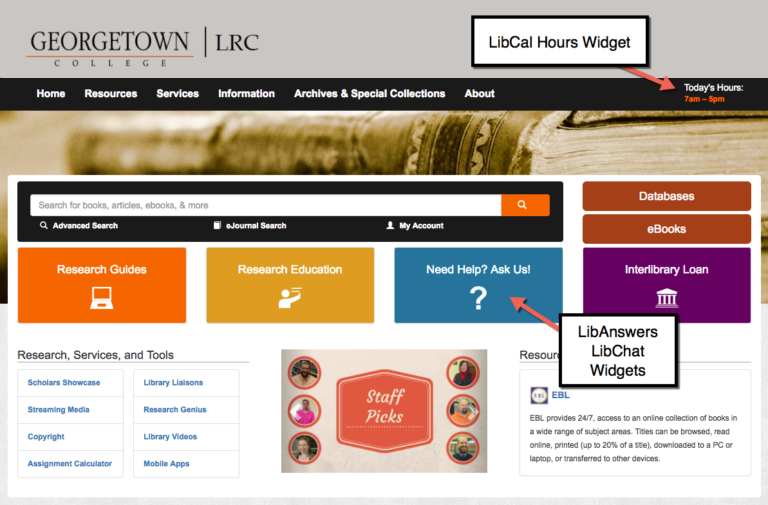 On their library homepage, an embedded LibCal Hours widget automatically updates to display today’s hours… no manual updating needed. Their reference services are prominently showcased, with embedded LibAnswers LibChat widgets promoting their live reference assistance and a customized Ask Us form that routes all queries right into their LibAnswers ticketing queue. All library forms, from a book purchase request form to reporting a catalog error are created and stored using LibWizard. 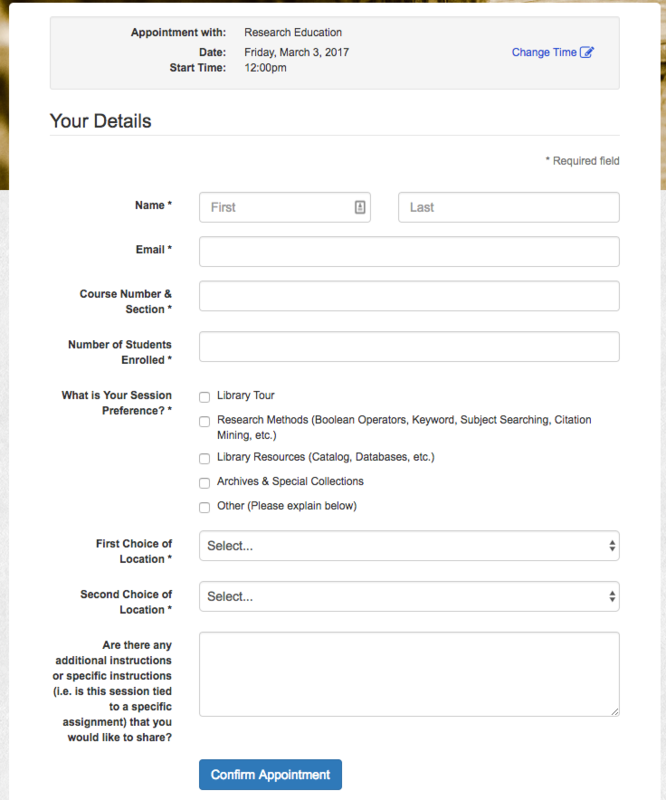 In an effort to streamline work processes, their library student application is a LibWizard form! 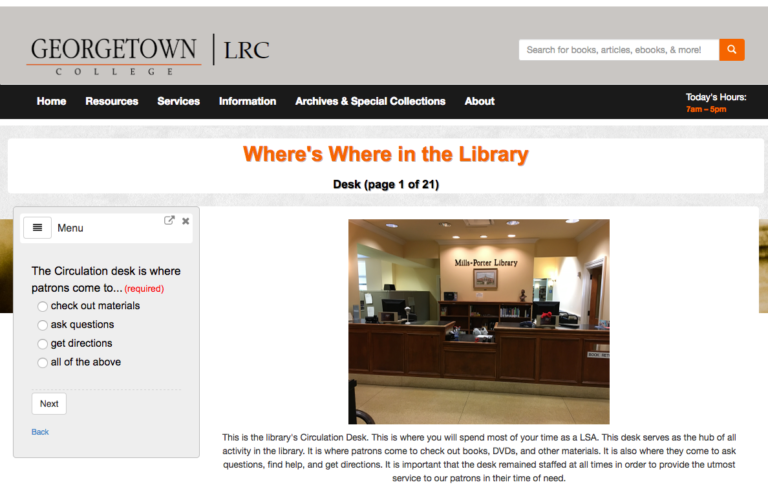 This way, librarians only have to go to one place, LibWizard, to view all form submissions. 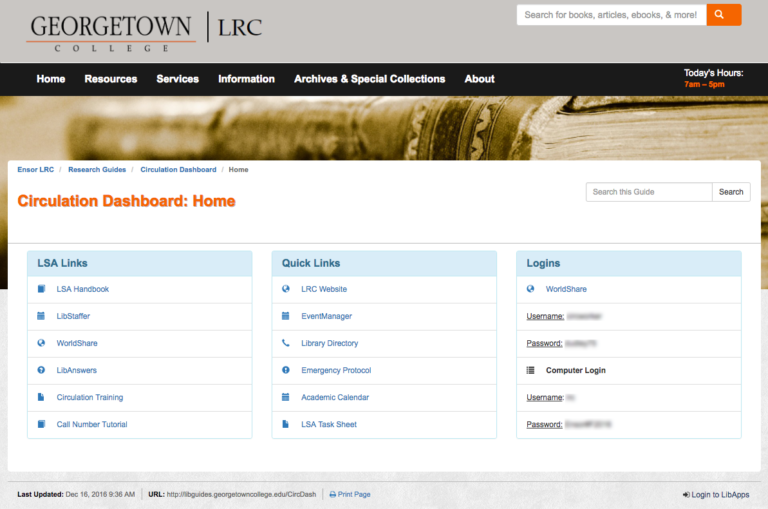 All library student employees are trained using a combination of LibGuides with embedded LibWizard tutorials. Talk about making your tools work for you! Circulation Student employees access the Circ Dashboard LibGuide when they sign into the circ desk computers. From here, they can easily view their work schedules via LibStaffer, access library quick links, and take interactive training with LibWizard tutorials. Since they’ve already used LibWizard to submit their student application forms, the process is consistent and seamless. As Andrew said, “everything they need – put in one spot”. Andrew presented at the October 2016 SpringyCamp on training student workers using LibGuides and LibWizard. View Andrew’s presentation and download his slides. Even the library’s staff directory is a product of integration. Andrew maintains the Library Staff directory as a published LibAnswers FAQ, making it easy for anyone searching the FAQ database to find staff email addresses and phone numbers. But, what if they’re not in the FAQ database? How do they find that information? 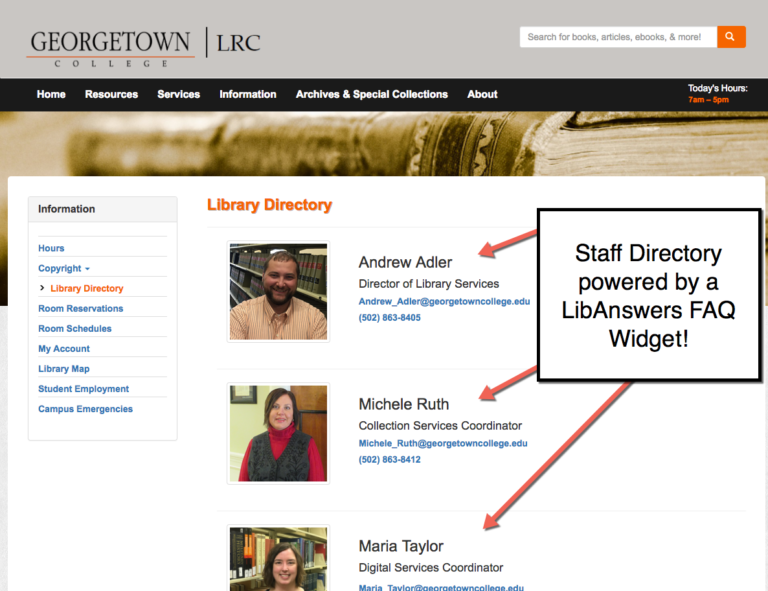 Simply embed that Staff Directory FAQ as a widget into any webpage, including their LibGuides CMS-powered website. This way, Andrew only has to update the directory in one place, the FAQ, and watch those updates trickle down to everywhere it’s been embedded. The same consistent information is easily syndicated across multiple platforms and is easy to maintain from one central location. Andrew wanted to create an online process where faculty could request library instruction as quickly and efficiently as possible. Email wasn’t cutting it, creating a lot of unnecessary back and forth. Plus, the Library maintains access to several IL-Classrooms so pointing faculty to a room reservation system would have required that Faculty know which room to request and when. Using an outside-the-box solution, Andrew repurposed their LibCal My Scheduler as a tool for faculty to book library instruction. Most libraries use the My Scheduler tool to coordinate and schedule one-on-one research consultations. But Andrew saw it as a way to streamline their IL-Booking process. Faculty select their preferred date and time, and share their session preferences and class notes to ensure that the instruction is as targeted as possible – for the student’s benefit. Andrew receives the request, selects the appropriate classroom, and it’s all done…in just a few clicks. Easy-peasy. These IL-Instruction Stats, and all stats from their Springshare tools, are automatically funneled into their LibInsight data gathering tool. From here, Andrew can run reports on how many classes were taught last semester, hits they had on their Library Website, and chats/texts/email reference questions they received. Every year, Andrew meets with the Georgetown College Provost to cover the library budget. As is typical at these meetings, every line item is scrutinized. 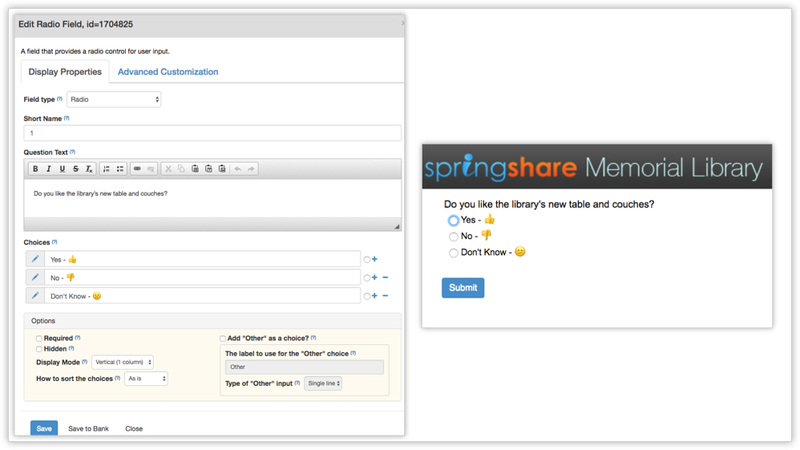 Andrew makes it clear that their use of Springshare tools are an essential library service. We have a post-Valentine’s day gift for the LibWizard community – the 1.7.9 update is now live! With this update we’re bringing you enhanced feedback options, which ensure patrons get the maximum amount of feedback for better learning outcomes. Read on for the new features that are making our hearts flutter! Show All Questions & Answers on the Thank You page – When patrons finish a quiz or assessment, wouldn’t it be nice to give them immediate feedback on all of the questions they answered? With this update, now you can! Head to the Thank You screen to see the new option for “Display correct answers and patron answers”. When you use this feature, we’ll display all of the responses that the patron provided at the end of the quiz or assessment, alongside the correct answer for each question and any question-related feedback you may have provided in the quiz or tutorial. This provides the patron with the full picture of how they performed on their quiz or assessment, and provides easy take-away info for continuous learning improvement. Not Requiring a Correct Answer to Provide Feedback – Previously, it was only possible to give a learner correct/incorrect answer feedback by requiring an answer to be correct in order to move on. We realized that this was a bit limiting, so we’ve changed things – from now on, these are treated as separate settings, so it’s still possible to require a correct answer to continue, but you can still provide feedback on correct and incorrect answers to the patron without this requirement. Display Grade as a Percentage, OR as Number of Questions Right/Wrong – A small yet popular feature request – if you choose to display a grade to the patron when they finish a quiz or assessment, you can now choose what form that grade should take. You’ll see this option on the Thank You screen, listed as Grade Display Type – choose whether you’d like to display the grade as a percentage (ie “You scored 80%”) or as the number of questions correct (ie “You answered 7 out of 9 questions correctly”). New Drag and Drop File Uploads – In a big move for convenience, we’ve added a super simple drag and drop file uploader, which reduces the number of clicks required to upload files on both the public and administrative sides of the system! To upload a file (up to 20 MB), just grab the file and drag it into the uploader. Of course if you prefer, you can still click on the uploader to choose a file from your computer. File Uploads Included in Email Confirmations – We now include a link to uploaded files in the email confirmation messages sent to patrons / anyone on the email notification list, so you’ll no longer have to head to the reports area to view files. We’ve adjusted the look of the edit question screen – now, instead of relying on accordions for the 3 main editing sections (Display Properties, Answer Properties, and Advanced Customization), we’ve moved these sections into 3 separate tabs. Hopefully this will make the various editing options a bit more obvious. Previously, the file upload option could sometimes fail on the public side of the system, especially in cases where you had more than one file upload on a page, or a file upload was a required question. We’ve squashed these critters so the file upload will work reliably for patrons. We’ve updated the option to “Use Spam Control” so it’s in use by default. Our spam control uses a honeypot method – it includes a field that is intentionally hidden so that humans don’t enter data in it. If the field is empty, as it should be, then the user can continue to the next page. Spam robots, however, will still detect that field and try to enter data in it (or in other words, stick their hand in the honeypot). When this happens, this prevents the robot from proceeding. There were a couple of bugs that cropped up with the new Rich Text question and answer entries, where including HTML in the question or answer text could cause issues with questions being saved to the question bank, and certain fields were not saving correctly if they included HTML. These issues have been resolved in this update. LibWizard 1.7.7 Update Now Live! Have you ever wanted to change the colors of a form, survey, quiz or assessment so it’s snazzier and more eye catching? Then do we have big news for you – we’ve added super simple color pickers to all LibWizard modules! Previously, customizing the colors of elements in LibWizard could take a bit of doing and required a good amount of CSS knowledge for optimal results. But no more – we’ve added simple color pickers for individual system assets, as well as for the site as a whole via the system settings. Customize any major element of any quiz, survey, etc. – from background colors to fonts and font colors to the all new optional border, our color pickers have you covered. To start customizing a survey, quiz, etc., head to the builder and select Options > Look and Feel > Page Fonts and Colors. To customize colors across your site, Admins can head to Admin > System Settings > Custom Colors. Have you ever wanted to include a file upload as part of your surveys, quizzes, etc.? Perhaps you’re collecting documents for your institution’s IRB, or collecting proposals for an upcoming conference. Whatever the reason, we have great news for you – file uploads are now available as part of the full LibWizard platform! Whether it’s collecting a list of works cited as part of an Assessment or taking submissions for your “Why I love the Library” photo essay, you can keep track of all of this and more with the LibWizard platform. Enable file uploads in your LibWizard assets by heading to the builder and choosing the new File Upload content type. Good to know: File uploads are currently limited to 20mb per upload, and are retained until the form, survey, etc. is deleted. Do you frequently find yourself embedding forms, surveys, quizzes and assessments in https based websites (like a course management system, or perhaps your main library website)? Then this feature is for you – we’re introducing optional HTTPS support for all LibWizard sites. If you’re ready to make the switch to force all LibWizard content (both the builder as well as individual forms, assessments, etc.) to load via HTTPS, admins can head to Admin > System Settings > Misc. Settings and select Enable HTTPS. Good to know: Enabling this setting means that all content added to your site must also be loaded via HTTPS. This will impact all content that librarians create in the site – all page URLs shown in Assessment & Tutorial slides, as well as image uploads, etc. must also load via HTTPS in order to avoid mixed content error messages. Spaces Can’t Bypass Required Questions – Previously, required questions could be bypassed by entering a space (or spaces) instead of a “real” answer. We’ve changed this behavior so responses that just contain spaces won’t pass the required check. Print Individual Responses – We’ve added a Print button to the “preview” view of individual patron responses, so they’ll print with ease. We fixed a bug in Numeric fields, where initial responses that fell outside of the required minimum/maximum setting were being recorded. This now generates an error message, and the response is not recorded within the reports. We addressed an issue with Account Permissions, where making an asset “public” made it both visible and editable for all regular level users in your LibWizard site. Now, setting an asset to “public” will make the asset and any responses visible to other regular users, but they won’t be able to edit its contents. As always, thanks so much for your great feedback. We hope you’re as excited for these new LibWizard features as we are – don’t hesitate to drop us a line and let us know what you think!